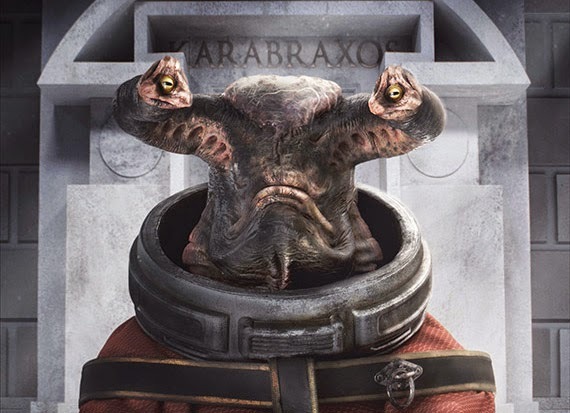 Doctor Who: Series 8 With Hindsight - TIME HEIST | Warped Factor - Words in the Key of Geek. Tony Fyler takes time out. I had a few problems with Time Heist when it was broadcast. 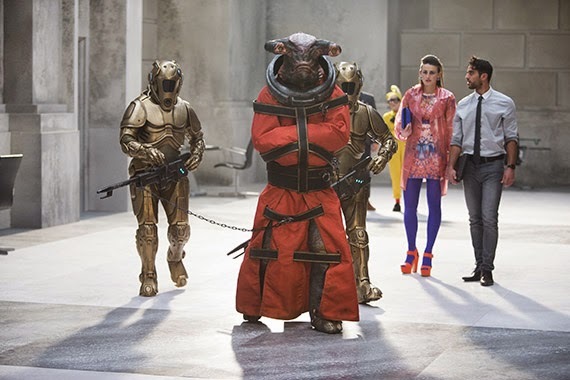 In fact, for me, Time Heist was the first serious miss-step of Series 8, and remained my least favourite episode, even in the face of the Kill The Moon ‘hatching’ and the Forest of the Night oversweetened silliness, and even in the face of Missy’s in-flight safety briefing which ruined a good chunk of Cyber nightmare in Death In Heaven. Doctor Who does heist movie is a pitch that gives you such scope, but when it was broadcast, Time Heist nearly sent me to sleep. Why? Because it was all so massively predictable, relying on you not putting two and two together and making the only obvious four in the room, while leaning on sharp cuts to deliver pace and atmosphere, chronically mis-using Keeley Hawes, and being riddled with logical inconsistencies en route to a re-run of the Hide story. So – contrary to the previous three episodes, Time Heist with hindsight had a lot to do. Rather than simply not deteriorating with distance, Time Heist actually had to improve with age if it was ever going to wring praise from me. So let’s see. The pre-credits sequence actually stands up pretty well – Clara en route for another date with Danny (who doesn’t improve either with contemporaneous time, or with hindsight when you know he’ll soon be dead). The Doctor who apparently ‘has a whole day worked out’ despite throwing suggestions about, the adorable but highly-scripted misunderstanding of her going on a date, and the Tardis phone ringing to bring the Doctor ‘another playmate. The cut to the room with the would-be bank robbers all holding memory worms is well-managed, and the introductions are effectively, if unimaginatively handled by getting them all to declare their name, place of origin and agreement to the mission. It is this sort of script-writing heavy-handedness that annoyed me on first watch – it’s the equivalent of a novelist having their character look at themselves in the mirror so as to have an excuse for describing them to the reader. In other words, it’s lazy and clichéd, but let’s move the hell on because it doesn’t make me want to throw things at the screen a year on (probably because as I rewatch it, it’s Magician’s Apprentice day!). Oh, one very nice touch in the pre-credits though – the gold coming out of the case as they open it – if you’re going to steal, why not steal from Tarantino? And while the plot is pretty much right there in the title, there’s a sense of excitement built by the premise of the pre-credit sequence. Four people in a room, who’ve wiped their memories. OK, what’s that about? Immediately after the credits though, there are two acres more of the lazy exposition – screens show ‘the Architect’ and he talks the robbers and we the audience through the bank of Karabraxos. There is of course usually a scene like this in heist movies. Think Ocean’s Eleven (modern version), and you can hear George Clooney outlining the number of cons that need to be pulled off to get from A to B to C, C being the vault where all the money is. But there’s something – perhaps it’s simply the tediously treated voice of the Architect – that makes the expositional info-dumping here feel especially uninspired and uninspiring. The briefing scene should fill you with a sense of the scale of the mission, but it’s treated here almost like a joke, almost like a promotional video for the bank security firm – a feeling probably down to the use of the glowing golden “K” logo to switch from scene to scene, and the slightly stilted movement of the extras it stars. 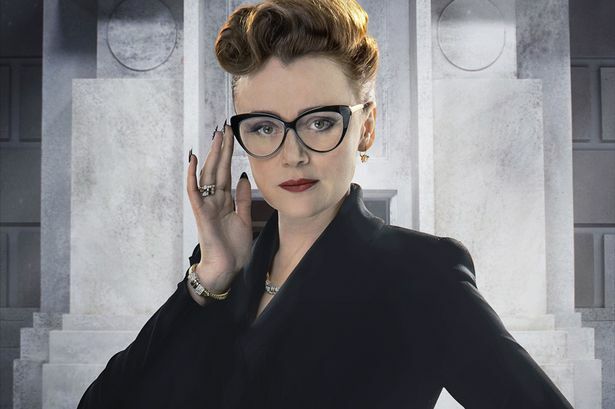 Switching to Miss Delphox, we can’t help look at her office and think “Yowzer – no budget left then?” It may well be designed to tip us off about her status as a clone, but it looks like cheap 80s Who, and I can’t say this often enough, but Keeley Hawes is mis-cast behind those enormous owl glasses. She’s great in any number of roles, but as the head of security at the most impregnable bank in the universe – no. Naturally of course, the rewards for a heist like this have to be worth it. But even so, when you finally find out what they are, there’s a touch of science-fiction literalism about them that still depresses. A ‘neophyte circuit’ for the hacker who jettisoned his own past, that can not only reboot any system (reasonably believable) but also replace any lost data (how? It’s either lost or it isn’t. If it can be extrapolated from the holes it leaves behind, it’s not lost). Gene suppressant for the shapeshifter (makes perfect logical sense, even if the dream of ‘being normal’ is clichéd). Once caught by the Teller and brought to Miss Delphox, there are threats of being ‘Tellered’ and it sounds as though Miss Delphox intends to use her pet on them, then, suddenly and with no logic at all, she takes it to hibernation and leaves the two ‘guards’ to dispose of the Doctor and Clara. The guards turn out to be the not-dead Psi and Saibra and all is well, then with a jump cut, they’re all the way back down from Delphox’s office into the ducting again. So let’s re-cap. With hindsight, it’s not that Time Heist has got any better. It’s still one of the least inspired scripts of recent years, that skates by the dictates of logic with a twinkle in its eye and a ‘you love me really.’ There is redemption there in the final scenes, but the overwhelming feeling it leaves behind is that redemption shouldn’t really have been necessary. In the hands of more imaginative writers, Time Heist could have been a splendid thing – the performances were there to justify splendidness. As it stands, it’s just a solid block of ‘Well, that happened,’ sitting in the middle of a season that started with a bang and began to get increasingly wobbly towards the mid-section before firming up again at the end. One to rewatch? In a universe where Pyramids of Mars, Terror of the Zygons, The Caves of Androzani, The God Complex, and Flatline exist, probably not.